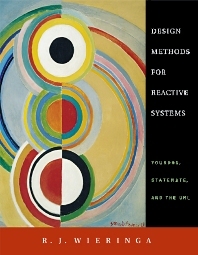 Design Methods for Reactive Systems describes methods and techniques for the design of software systems—particularly reactive software systems that engage in stimulus-response behavior. Such systems, which include information systems, workflow management systems, systems for e-commerce, production control systems, and embedded software, increasingly embody design aspects previously considered alone—such as complex information processing, non-trivial behavior, and communication between different components—aspects traditionally treated separately by classic software design methodologies. But, as this book illustrates, the software designer is better served by the ability to intelligently pick and choose from among a variety of techniques according to the particular demands and properties of the system under development. Shows how the techniques and design approaches of the three most popular design methods can be combined in a flexible, problem-driven manner. Pedagogical features include summaries, rehearsal questions, exercises, discussion questions, and numerous case studies. Students, engineers, teachers, and researchers in software development or software engineering. Roel Wieringa is professor in the Department of Computer Science at the University of Twente, The Netherlands. He is author of Requirements Engineering (Wiley) and has edited several other books and published over 50 papers on software design methods. He has been involved in several national and international research projects with academia and industry in the area of requirements specification, distributed information systems, and software design methods.